Governor Bill Walker will name someone to a seat on the Alaska Supreme Court within the next few days. Four people have been nominated to fill the seat vacated by retiring Justice Dana Fabe. They include Susan Carney of the Office of Public Advocacy in Fairbanks, Superior Court Judge Andrew Guidi of Anchorage, private attorney Jahna Lindemuth of Anchorage, and Superior Court Judge Philip Pallenberg of Juneau. Attorneys in the Capital City are worried that the governor will pick someone who has little background or experience with Southeast Alaska issues. The Juneau Bar Association, a voluntary, largely informal organization based in the Capital City, recently drafted a letter urging Governor Bill Walker to consider someone from Southeast Alaska for appointment to the Alaska Supreme Court. The Juneau Bar Association’s Lael Harrison says they regretted not speaking up when a new justice was appointed in 2013 to fill the seat formerly held by retiring Justice Bud Carpeneti of Juneau. Harrison said a local or Southeast appointment to the high court could be important – for example – for their knowledge of the area geography, cultural differences, transportation challenges, and courtroom practices. According to research by court system staff, this is not the first time that a judge from Juneau has not sat on the Supreme Court. The longest period occurred from 1980 to 1996. The court also lacked a representative from Fairbanks from 1997 to 2007. Bryner said they have multiple duties when they serve on the high court. Of course, they’re required to consider appeals from lower courts, hearing arguments and circulating opinions on any civil cases before them. They also have discretion to hear criminal cases appealed from the Alaska Court of Appeals. But that’s not all. Justices have the final word when it comes to disciplining Alaska attorneys and other judges for bad conduct. Bryner says they also establish the rules of procedure for the entire Alaska court system, and help manage all 39 courthouses, 73 judges, and 750 employees. Essentially, justices sit as a board of directors to the court system’s C-E-O or administrative director. The Alaska Supreme Court has always been based out of Anchorage, although justices occasionally hear arguments in other communities and high schools around the state. When a vacancy opens up in any state courthouse, the non-partisan Alaska Judicial Council solicits applications, and then vets and interviews applicants for the bench. Executive Director Susanne DiPietro says they evaluate all the applicants for their knowledge of Alaska law, competence, fairness, integrity, temperament, judgment, life experience, and commitment to public and community service. “I think there’s a school of thought that says people who have all kinds of different experiences — whether they’re from different socioeconomic classes, different geographical areas, different ethnicities maybe who have those life experiences — people will say those are important things that are brought to the decision-making process, but not in terms of knowing things (or) knowing facts in the record, but in terms of just the way you think or analyze or view the world,” DiPietro said. And Bryner, who served as chairman ex officio of the Alaska Judicial Council while he sat as Chief Justice, confirmed that much more goes into evaluating candidates for the high court. When the Council is done with the screening process, they usually send to the governor names of at least two candidates they believe would be qualified. 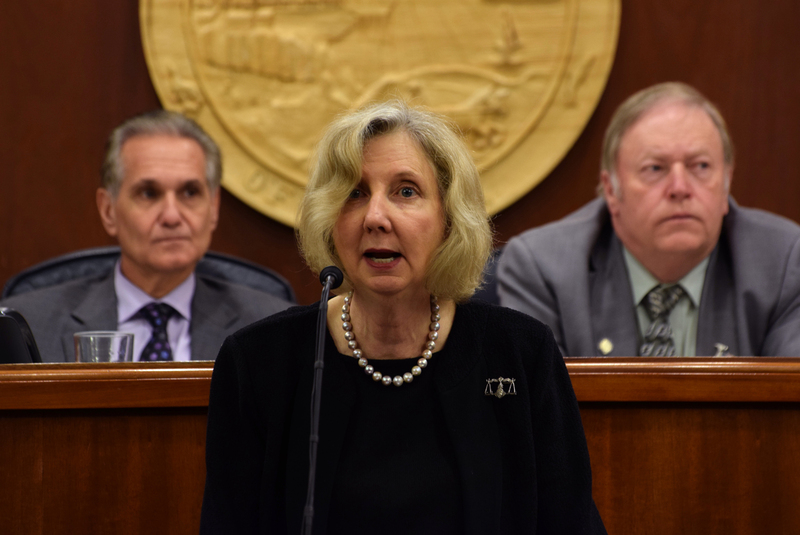 For the current vacancy on the Alaska Supreme Court, Governor Bill Walker has a choice of four nominees who currently make their home in Anchorage, Fairbanks or Juneau. Or – another way to look at it – he can pick from among two men and two women. According to the National Association of Women Judges, Alaska is well below the national average when it comes to appointing women to the bench. Depending on the governor’s selection, Alaska could join Idaho and Iowa as the only states which do not have a woman sitting on the highest appellate level court. Lael Harrison of the Juneau Bar Association says it’s not like they believe that other forms of diversity are unimportant. Governor Walker has until May 15 to pick a new justice. It’s possible he may announce his selection during the Alaska Bar Association annual convention starting May 11 in Anchorage.